Have you ever wondered how I draw a fashion figure? You’re not the only one. This post was a reader request – thanks Eliza! My technique is not original – it is based on studying texts and the instruction I received in university. I like to recommend books by Bina Abling and Steven Stipelman for aspiring fashion illustrators – be aware, not all fashion illustration texts are of equal quality. Now, I have done this so many times it is second nature, so I rarely create a draft this formal anymore, and my sketches are now much looser and more enigmatic. However, for clarity I’ve broken it down into 10 steps. If you can follow instructions, you too can draw a fashion figure. Grab three (or more) sheets of translucent layout paper or tracing paper, a pencil and whatever other art materials you’ve got on hand, and you’re ready to go. 1. Center Line. Start by drawing a straight line from the top of your sheet of paper to the bottom. You can use a ruler or go freehand if you like. Mark roughly where you want the top and bottom of your figure. Divide this segment into eight equal sections with small marks. I’ll refer to these marks in this post – for clarity, mark 1 is at the top. 2. Head and Attitude. Most fashion figures are 8-10 heads high. Mine tend to be around 8.5 heads high. Each section, therefore, stands for the height of a head. Draw an oval for the head in the top section. Then I like to take a few abstract, loose swipes to represent the movement of the figure. Because intentions count a lot in drawing, these lines help to give a fashion illustration mood and attitude – be confident, not hesitant. These lines can not be right or wrong. This is just the draft, and no one will see it, so don’t waste time erasing. If you don’t like a line, just draw another one – your eye will sort out which lines work best. 3. Spine, Shoulders and Hips. The next line represents the spine, and connects the head to the center mark on the vertical line. Are you familiar with contrapposto? This refers to the stance where the weight of the body is shifted to one leg which throws the shoulders and the hips into different angles. 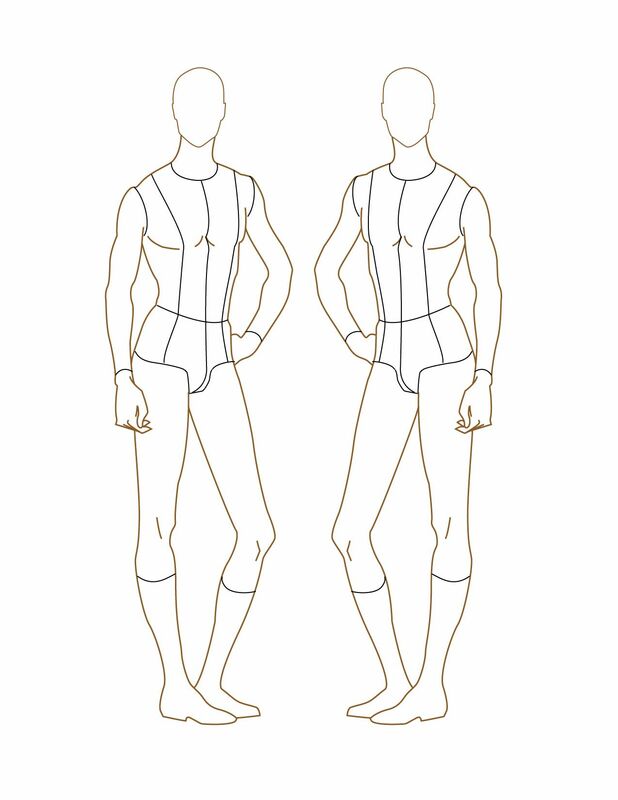 Almost all fashion figures are contrapposto. Draw a line halfway between the second segment, perpendicular to the angle of the neck for the shoulder. Draw another line at the center mark, perpendicular to the lower spine for the hips. 4. Torso. The body has two major solid sections with a soft spot in between, which you can see in action if you’ve ever watched a model walk in a runway video. The shoulders and the rib cage are one section, and the hip bones form the other. Draw simple trapezoidal shapes to represent each section, centered on the spine. Mark the navel on the spine around the fourth mark. The line of the breasts is around the third mark. Make sure the breasts are parallel with the shoulders or they’ll look crazy. The other thing to remember is that each breast is equidistant from the spine. 5. Hands and Elbows. Decide what you want to do with the hands. I have one resting on the hip and one hanging down in a classic fashion pose. Starting with the hand first is the best trick I know for drawing a hand that looks like it is plausibly resting on a hip. Draw little shapes to stand in for the hands. Remember that the hands hang at about crotch level, at the center mark. Elbows hang at the fourth mark, aligned with the navel. For both arms, you can figure out where the elbow is by marking the radius of the elbow from the shoulder. 6. Arms, Legs and Feet. Since you know where the elbows fall, all you have to remember when you draw lines for the arms is that the forearm and the upper arm are the same length. For the legs, draw a line for each. Each leg has to be the same length so you’ll know where to put the feet. Remember to put a foot on either side of the center line – or if you’re brave, right on the center line like I did. If you put both feet on one side of the center line, she’ll look like she’s falling over. The knees are halfway between the ankles and the hips and just about parallel with the hips. At this point you should have a stick figure with even proportions – always double check. The major one is to make sure of is that the legs are as long or longer than the length of the torso and the head together. Forearms should equal upper arms, calf length is equal to thigh length, and so on. 7. Flesh and Face. Grab a second sheet of paper – you’re ready to flesh out your stick figure. 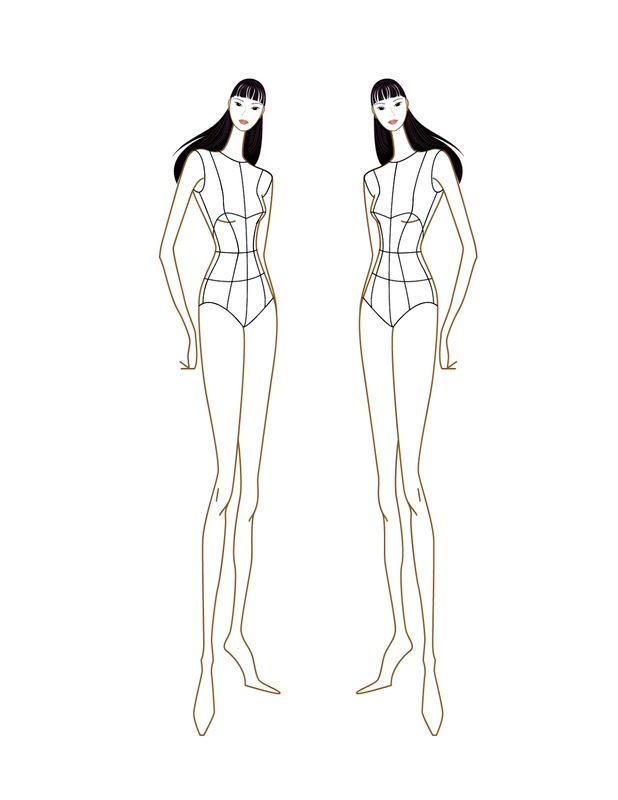 This is easier with practice – you can draw oval shapes to represent the thighs and calves to help you out. Feel free to use photo or a mirror for reference when working out tricky bits like hands and feet. If something looks wrong, just keep drawing lines until one looks right. This is just the second draft – no one is going to see this one either, so don’t bother with erasing. Feel free to make changes and adjustments as you go – you can see I’ve changed one of the feet to a side view. To draft the face, draw a cross through the middle of your egg shape. The eyes are equidistant from the center, halfway between the top of the head and the bottom of the chin. The tip of the nose is halfway between the eyes and the chin, and the mouth is halfway between the nose and the chin. 8. Clothes and Hair. Now you’re ready to start dressing your figure and giving her hair. Use the center front line to help you with things like buttons and fly fronts. I’ve given her a very simple outfit that I would wear (though I don’t wear heels). If you’re putting a skirt on her, remember that the hem is parallel with the waist, or if the skirt sits on the hips, the hem will be parallel with the hips. 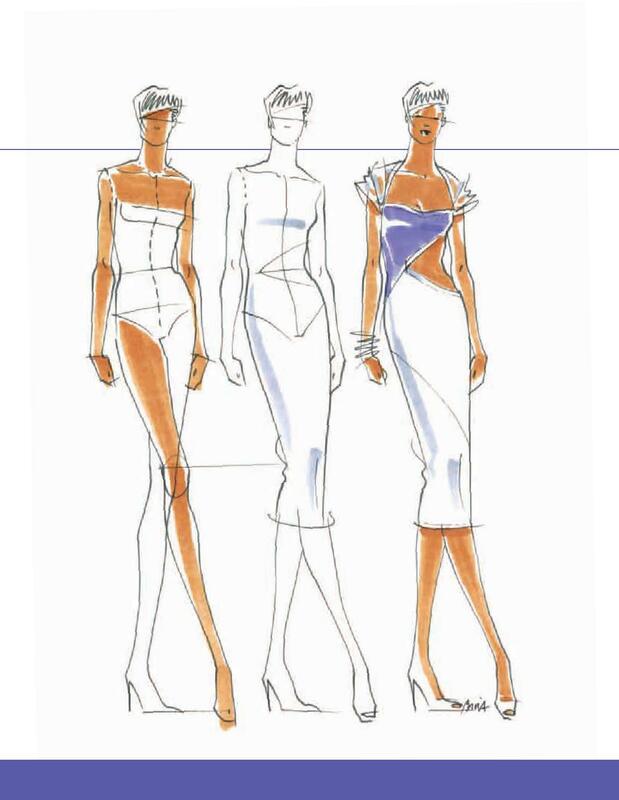 Curve edges like cuffs, necklines and waistbands so they appear to be wrapping around the figure rather than resting on top of the figure. 9. Rendering. Grab one more sheet of paper, you’re finally ready to create the actual illustration! Out of the tangle of lines on your draft, just trace over the ones that you feel look right. In this case, I’ve just taken another sheet of layout paper and inked it in with various widths of Micron art pens – 0.1 for small details, 0.3 to define some of the edges, and an outline around the figure of 0.5. Less is more when it comes to inking, especially for details – a few quick, brief marks work better than lots of fussy, careful ones. If you’re using a thicker paper you’ll need a light box to help you trace your draft. You can use any materials you want to render the final – watercolours, pastels, markers – whatever you enjoy using. Because you’ve got a solid draft with good proportions, the final illustration should turn out fairly well no matter how you do it. 10. Colouring on Photoshop. (Top of the post!) If you inked it like I did, you can scan it into your computer at 300 dpi or higher. Open it in Photoshop and fiddle around with the levels or the contrast or whatever tools you prefer to create pure black lines on a white background. Clean the lines up up if you like – this is another chance to fix minor mistakes in inking. Then I add another layer on the multiply setting to colour it in. You can drop in textures if you have them, like I did for the denim. The dodge and burn tools are an easy way to create shading and highlights. There’s a million different ways to use Photoshop and you can always hit Ctrl+Z so just play around until you’re happy with the results. There you go! You have illustrated a fashion figure. If you used this tutorial, I’d love to see what you came up with. Send me a note!